Its initial design was based on a building at Chicago’s moderne 1933 and 1934 ‘A Century of Progress International Exposition,’ but in harmony with its island location. The final tropical moderne design featured a large garden courtyard between the street and auditorium entrance, with lush plants surrounding a large fountain. No expense was spared in its construction and furnishings. This was intended to be owner’s (Consolidated Amusement) deluxe flagship theater. Renovations in the late-60s, and remodeling a decade or so later kept the theater on life support. An expanded concession area replaced most of the forecourt, the interior decoration was removed and the auditorium draped. 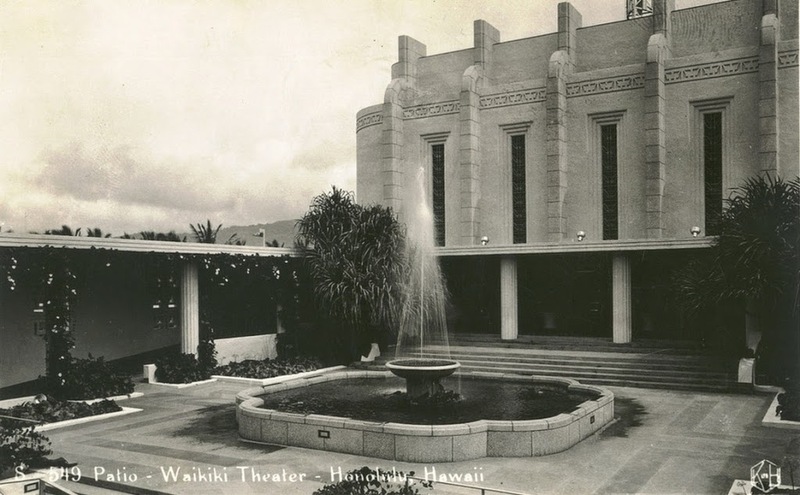 The image shows the Waikīkī Theater in her early years. I have added other images to a folder of like name in the Photos section on my Facebook and Google+ pages.